Under the rule of dictator Nicolae Ceausescu, thousands of Romanian children were placed in overcrowded orphanages with bleak conditions and minimal human contact. Even after the 1989 revolution, the legacy of institutionalization continued. Only recently has research and public concern over early childhood environments caused changes in policies. 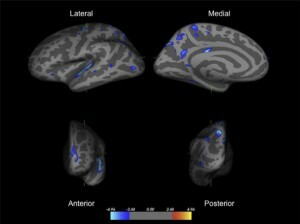 University of Washington research on children who began life in these institutions shows that early childhood neglect is associated with changes in brain structure. A paper published this month in Biological Psychiatry shows that children who spent their early years in these institutions have thinner brain tissue in cortical areas that correspond to impulse control and attention. “These differences suggest a way that the early care environment has dramatic and lasting effects for children’s functioning,” said lead author Katie McLaughlin, a UW assistant professor of psychology. Since 2000, the Bucharest Early Intervention Project has worked to document and treat the children’s health. McLaughlin joined the team about six years ago to focus on brain development. This study is among the first in any setting to document how social deprivation in early life affects the thickness of the cortex, the thin folded layer of gray matter that forms the outer layer of the brain. “We find a pervasive pattern of differences [among institutionalized children] in areas of the brain related to attention, working memory and social cognition,” McLaughlin said. It’s known that children raised in institutions tend to have attention deficit hyperactivity disorder, or ADHD, about four or five times more often than other children, McLaughlin said. The new work suggests how this happens. The study provides “very strong support” for a link between the early environment and ADHD, McLaughlin said. Researchers compared brain scans from 58 children who spent at least some time in institutions and 22 non-institutionalized children from nearby communities, all between the ages of 8 and 10. This was the first time in the ongoing study that the children underwent an MRI scan, which creates a 3-D map of the brain. Related research last year found children raised in the orphanages had less gray matter overall, while this study pinpoints the location of those differences. The most significant changes were in areas of the brain related to working memory and attention. The brain scan images can explain more than 75 percent of the difference in symptoms of ADHD between kids who did and did not spend time in institutions. Thinning was seen in children who left the institution as early as 8 months of age. Researchers also found that the thinner the brain tissue, the more symptoms of inattention and impulsivity the children displayed. Researchers did not find differences in the volume of sub-cortical structures. No significant difference was seen between girls and boys, who were about equally represented. When the study began in 2000, some of the young children remained in institutions, while others were adopted by foster families selected and trained by the research team to try to reverse the effects of early neglect. Of the children in the study who spent time in an institution, the new study finds little differences in brain structure between the 31 who remained for a longer time and the 27 who went into high-quality foster care before their third birthday. “It’s surprising, and a little disappointing,” McLaughlin said. Most characteristics measured by the study were dramatically improved among the children moved to foster care. “It’s one of the few areas [of behavior] where you don’t see improvements,” McLaughlin said. The researchers can’t pinpoint exactly which conditions acted to alter brain development. Babies in the institutions had their physical needs met but they lacked socialization, language exposure, human touch and emotional attachment with their caregiver. Future research will try to tease out which stimuli are most important for brain development and at what ages. ADHD has many different causes and can often be treated, McLaughlin said. This study only looked at the link to childhood deprivation. The results are meaningful for other countries, such as those in Africa, where orphanages and institutions are becoming more common. The findings may also be relevant for less-extreme situations of neglect. “Paying attention to very early care environments should be an important public health priority, especially for abandoned or orphaned children,” McLaughlin said. She will soon participate in a follow-up study in Bucharest. The children, now teenagers around 16 years old, will participate in physical and mental health checkups and can opt to participate in more detailed tests such as the brain scans. The three researchers who lead the Bucharest early intervention study – Charles Nelson at Harvard Medical School, Nathan Fox at the University of Maryland and Charles Zeanah at Tulane University – are co-authors on the paper. Other co-authors are Margaret Sheridan and Warren Winter at Harvard Medical School. The research was funded by the John D. and Catherine T. MacArthur Foundation and the National Institutes of Health. For more information, contact McLaughlin at mclaughk@uw.edu or 206-616-7863.